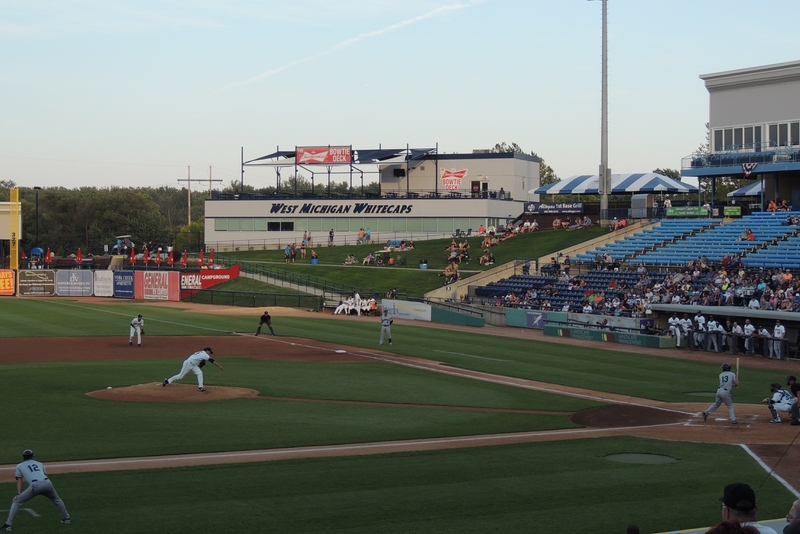 The West Michigan Whitecaps have three construction projects lined up for Fifth Third Ballpark this offseason, with the first one getting underway last week. The first project is replacement of the warning track to improve drainage of the field. The warning track will be expanded by two-to-three feet along both baselines, for player safety and for easier maneuvering of equipment onto the field for promotions and non-baseball events. The color of the new warning track will be a darker red than the previous clay mixture. The second project will be construction of a new hospitality area in the lower lawn area on the third-base side of the ballpark, directly behind the visitor’s bullpen. It will be a 3,000-square-foot hospitality area with a seating capacity of 120. There will be three types of seating, including padded chairs with a food and drink rail; patio tables and chairs; and cushioned chairs. The space can be booked by groups, but also will be available for individual ticket buyers on select dates. The Whitecaps are also expanding their playground in the area beyond the right-field corner, from 2,500 square feet to 6,400 square feet. All three projects are expected to be finished by Opening Day 2017.